Over the years I've begun to sharpen my cooking/baking skills. My dad was always the main cook growing up and he learned from his mother, so he taught me most of what I know. However, my mother did have a few "signature" dishes/recipes that were always family favorites and frequently called upon to make. Two of these legendary recipes were Strawberry Jam and Banana Pudding. 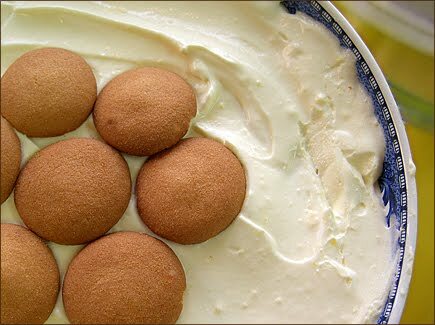 The Banana Pudding was always one of my favorites and I knew that my mom's recipe was so different than other people's banana pudding recipes. I always assumed she'd gotten it from someone in her family. Imagine my sadness when, a year or two ago when I wanted to try and make it on my own, I discovered that it was simply a recipe listed on the back of the Nilla Wafer box years and years ago! I was devastated. Thankfully, it is no longer still on there, but my romantic visions of a secret family recipe quickly vanished. I have since gone on to tweak that recipe into something of my own creation...which brings me to the Strawberry Jam. This one, I was absolutely positive, was a family recipe. I remember making this with my mom, grandmother and great-grandmother EVERY strawberry season. It took at least a day to make properly and when we all got together we made huge quantities and froze the extra. Again, a few years ago my mother and I went to pick strawberries and decided to try the recipe. Imagine my shock when my mom pulls out a box of Sure-Jell clear gelatin and proceeds to read the recipe from the BACK OF THE BOX!! Such heartache ensued. So, what does this mean to me? Well, I still make both recipes...using the boxes as guides. However, I've come to realize that knowledge doesn't always mean power. Sometimes, it's quite the opposite.